Parashat Nitzavim speaks to me about God’s love for us and about our opportunity to reflect this love. “The [Torah] is very close to you, in your mouth and in your heart, to observe it.” (Deuteronomy 30:14). 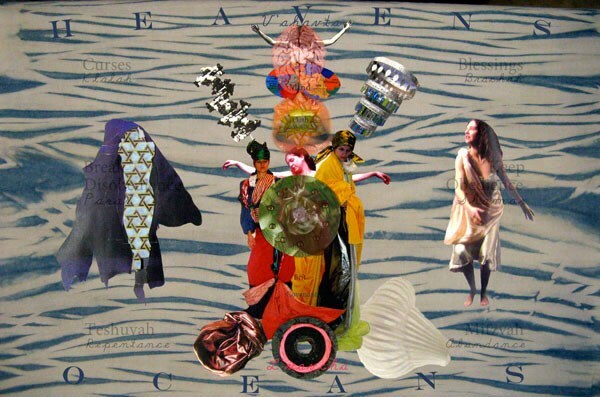 I’ve employed female figures — a collage amalgamation of Jewish women over time — at the points of the mouth and heart to communicate the idea of closeness, nearness, all qualities of love. I envision an embrace, as with the heightened connection between lovers. This embrace is between the Torah and the Jewish people as represented by the figure of a woman with the word “ואהבת / and you shall love” rising from her mouth and her heart. Professional Background Cheselyn Amato is an interdisciplinary visual artist and designer, Jewish and interreligious thinker, practitioner and activist, kabbalist, and nomadic temple builder. Her work has been exhibited and collected in various venues, including the Philadelphia Museum of Art, the Contemporary Jewish Museum in San Francisco, the Jewish Museum in New York City, and the Spertus Museum in Chicago.